COULD STOMACH ACID IMBALANCE BE CAUSING YOUR HEALTH PROBLEMS? It takes more than eating organically grown whole foods to stay young and healthy. You must also have good digestion and assimilation. Foods we eat have to be broken down before they can be absorbed, and the pH balance of the stomach plays an important role in how we break down and process the nutrients. If the acidity of the stomach is imbalanced, then normal digestion and assimilation cannot occur. The normal stomach contains hydrochloric acid, pepsin, mucin and the intrinsic factor. The hydrochloric acid and pepsin initiate digestion and the mucin coats the wall of the stomach. poorly absorbed when stomach acid is low. 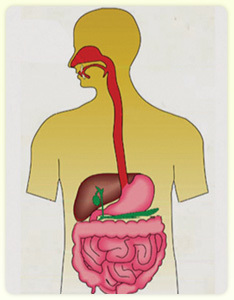 Overall, nutrients from food are under-digested and eventually mal-absorbed by individuals with poor stomach function. The consequences of this mal-absorption are monumental. Low stomach acid leads to alterations of your intestinal microflora. Friendly intestinal microorganisms are dependent on the natural intestinal pH balance that results when all the digestive organs are working well. Lack of stomach acidity allows unfriendly and dangerous microorganisms, such as Candida albicans and the disease-causing bacteria Clostridium difficile, to enter and overpopulate the gastrointestinal tract. 1) A study published in the Journal of the American Medical Association demonstrated that people on acid blockers have a significantly higher risk of hip fractures caused by poor absorption of calcium. Many people have little or no hydrochloric acid in their stomach. Very often, the main cause of poor digestion and assimilation is a low level of stomach acid (hypochlorhydria). According to a research study conducted in the early 1900’s, fifty percent of people over the age of sixty had significantly low stomach acid. Many who have symptoms of hyperacidity, such as reflux, may actually have low stomach acid. Doctors don’t usually recognize the seriousness of this problem and make the problem worse by prescribing medications that suppress stomach acid production. This practice makes acid blocking drugs among the most prescribed medicines in the United States. Rarely is stomach acid measured before acid blocking drugs are prescribed, and once prescribed, patients often remain on them for many years. These drugs can make patients feel better temporarily, but turning off the stomach’s acid production results in poor digestion and assimilation of nutrients that are vital for the body’s ultimate health. Since many of the symptoms of too much acid and little to no stomach acid are the same, how do you know which one you have? You can only know if you test the acid contents of your stomach. This testing can be done by means of the Heidelberg Capsule Test, a state-of-the-art diagnostic tool for measuring pH levels and detecting imbalances in the digestive tract. The Heidelberg test is like a window into the digestive system. It tells us about food absorption and digestion by obtaining an accurate measurement of the pH balance of the stomach. The Heidelberg pH Capsule is a high-frequency radio transmitter and pH sensor encapsulated within a special polyacrylate (plastic) covering. The capsule is about the size of a multi-vitamin and is designed to be swallowed. It measures and transmits the pH levels in the digestive system and the re-acidification time of the stomach’s parietal cells. The Heidelberg Capsule system is one of the most valuable tools a doctor can have for safely and accurately determining disorders of digestion. Mal-absorption, stomach gas, belching, bloating, flatulence and irritable bowels can be addressed more thoroughly when the pH of the stomach is monitored. This test will accurately diagnose a patient who may have hypochlorhydria (low stomach acid), hyperchlorhydria (high stomach acid), achlorhydria (no stomach acid), pyloric insufficiency, or heavy mucus. The Center for Occupational and Environmental Medicine is one of the very few clinics in the United States able to perform this highly accurate Heidelberg test to assess the root cause of digestive symptoms. At the Center, we are committed to bringing you the most advanced and scientifically proven medicine. If you are suffering from fatigue, depression, mal-nutrition, acid reflux, gas, bloating, constipation, diarrhea, chest pain, or neurological disorders, you may be a candidate for this test. Based on your test results, the doctors will recommend individualized supplementation to help rebalance your stomach pH. Call The Center to set up an appointment to determine if you are properly digesting and assimilating the foods you eat, so you can prevent all the adverse effects of stomach acid imbalance. 1 Wright JV and Lenard L, Why Stomach Acid Is Good for You, Natural Relief From Heartburn, Indigestion, and GERD, Chapter 5. M. Evans and Company, New York City, 2001. 2 Dial S, Delaney JA, Barkun AN, Suissa S. “Use of gastric acid-suppressive agents and the risk of community-acquired Clostridium difficile-associated disease.” JAMA 2005 Dec 21;294(23):2989-95. 3 Yang YX, Lewis JD, Epstein S, Metz DC. “Long-term proton pump inhibitor therapy and risk of hip fracture.” JAMA 2006 Dec 27;296(24):2947-53. 4 Laheij RJ, et al. “Risk of community-acquired pneumonia and use of gastric acid-suppressive drugs.” JAMA 2004 Oct 27;292(16):1955-60. 5 Andres MR, Bingham JR. Tubeless gastric analysis with a radio-telemetering pill (Heidelberg capsule). Can Med Assoc J 1970;102:1087.